The Business Gateway Growth Hub for Leicester & Leicestershire will be ‘sharing their love of supporting businesses’ with delegates at the Love Business Expo. Expert business advisers will be on hand at the Growth Hub stand to offer free and impartial advice, discuss growth opportunities and signpost businesses to the best support available. Businesses will also be able to find out about sector specific support, free workshops to enhance knowledge and skills, and available grants or funding that meets their needs. The Growth Hub is there to save time and simplify the process for businesses looking to expand. Business support is a dynamic and fluid environment across the public and private sector, and it can be confusing to understand which service meets the needs of a business. The Growth Hub provides a mechanism for integrating local and national support, making it easier for businesses to quickly access the help and advice they need to thrive and grow. Helen Miller, Growth Hub Manager, said: “This will be our 4th year attending the Love Business Expo. 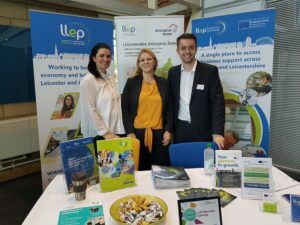 It’s a fantastic platform for us to meet and connect with many of the vibrant businesses across Leicestershire, as well as showcase the wide range of support opportunities available for them to grow and prosper”. “I met a Business Gateway adviser at Love Business in 2018 when I was looking for help with recruitment and manufacturing products. “My business retails products for dogs and I wanted to start making some of our own branded products too. Talking through the issues and receiving help with strategic decisions from the Business Gateway adviser has improved my business and my confidence”. “I would recommend businesses approach the Business Gateway to find out what’s available to help them. “For me it was a very eye opening exercise. I had not realising what support and funding existed and it has opened up many avenues, not just for today, but other opportunities in the future”. You will find the Business Gateway Growth Hub on stand T1 at Love Business EXPO 2019 on Wednesday 27th February at Holywell Park Conference Centre, Loughborough, from 9:30am-3pm. The expo is free to attend.